Samtec’s FireFly™ Micro Flyover System™ is a future proof, inside-the-box interconnect solution, with performance to 28 Gbps and proven 850 nm VCSEL array technology. Optical cable systems also include PCIe®. The Samtec Optical Group designs and supports micro optical engines, active optical assemblies, and high density ganged passive optical panel solutions. FireFly™ Micro Flyover System™ is a future-proof, inside-the-box mid-board optics interconnect solution, with performance to 28 Gbps per lane and a path to 56 Gbps. Designed for the interchangeability of copper and optical using the same high-performance connector set, this easy to assemble system improves signal integrity and increases signal path length to meet today’s data rate requirements and the next generation. With an industry leading miniature footprint, FireFly™ accommodates greater density and closer proximity to the IC for chip-to-chip, board-to-board, on-board and system-to-system connectivity. 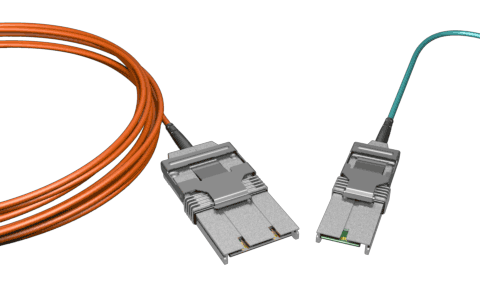 PCIe® active optical cable assemblies in x4 and x8 form factors with four independent, full-duplex optical channels to support Gen 3 data rates up to 100 meters. Features a fully integrated electrical to optical conversion engine available in full active optical cables with host and target, or half active optical cables with MTP end option. Passive optical cable systems support high-density applications with MTP end options and a single or double port adaptor for mating. Cable assembly available in 12 or 24 fibers and keying options on the adaptor for proper alignment.